We invite you to stop by either of our convenient locations and get to know the high standard of customer service that many of your neighbors in New Castle County and Cecil County have known for years. All locations of Premier Auto & Tire offer a 3 year/30,000 mile warranty on most repairs and services. Stop in today for a “Premier” experience! Brakes & Clutches are 1 Year. Tire Warranties are available. Ask for details. Premier Auto & Tire is here for all of your foreign and domestic automotive needs. We also specialize in 6.0 and 7.3 diesel repairs. In addition, we have technicians on staff that specialize in hybrid repairs. Here at Premier Auto & Tire, we know your vehicle is your second largest investment. We believe with our “TLC Program” that you can maximize the life and performance of your vehicle. Vehicles are under tremendouse stress each and every day to take care of our needs. Whether it is time for a 30, 60 or 90K service, Premier can handle it all. All of our services meet or exceed manufacturer’s requirements. Call and schedule your Preventative Maintenance K Service today. Let us help you avoid expensive repairs to your vehicle by doing the necessary maintenance. Let Premier Auto & Tire be your dealer alternative for factory scheduled maintenance. Did you know the average consumer keeps their vehicle for 9 1/2 years? Let us build a relationship with you and your vehicle before it’s out of warranty, so you can get the most out of your investment. Should your vehicle fail inspection, you have 30 days OR 1,000 miles to have any necessary repairs made and have your re-inspection completed. Premier Auto & Tire brings you the best in computer diagnostic services. We have the latest in Snap-On technology and the new Launch scan tool that is rare in the United States! We also have Iflash technology to reprogram vehicle computers on-site. 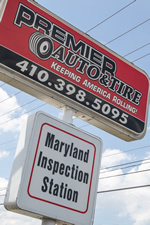 Premier Auto & Tire is a full service tire facility. We offer a full line of tires to choose from. Whether you are looking for performance, basic transportation or safety and stability, Premier has a tire for you and your family. Premier Auto & Tire has several expert advisors to help you make the right choice for your driving needs. We also have all of the latest state of the art equipment to get you and your family back on the road. At Premier Auto & Tire, we offer several tire specials including wheel alignment and free tire rotation with the purchase of four tires! Ask about our tire protection plans to give you piece of mind while traveling on the road. On the road, the safety of you and your loved ones often depends on the performance of your vehicle’s brake system. Proper brake maintenance will often make a difference when you need to make a sudden stop to avoid an accident. In today’s vehicles, brake systems are very complex. Whether you have an anti-lock brake problem or a hybrid vehicle, Premier Auto & Tire have ASE Certified Technicians ready to serve all of your vehicle’s brake system needs. Premier provides FREE Brake Inspection and Same – Day Service on all Brake systems. Let the certified trained professionals at Premier Auto & Tire be your choice when it comes to your family’s safety and stability on the road. Home Of The $99 Brake Job!